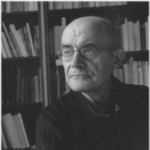 Jean-Luc Nancy's On the Commerce of Thinking concerns the particular communication of thoughts that takes place by means of the business of writing, producing, and selling books. His reflection is born out of his relation to the bookstore, in the first place his neighborhood one, but beyond that any such "perfumery, rotisserie, patisserie," as he calls them, dispensaries "of scents and flavors through which something like a fragrance or bouquet of the book is divined, presumed, sensed." 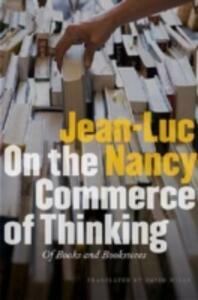 On the Commerce of Thinking is thus not only something of a semiology of the specific cultural practice that begins with the unique character of the writer's voice and culminates in a customer crossing the bookstore threshold, package under arm, on the way home to a comfortable chair, but also an understated yet persuasive plea in favor of an endangered species. In evoking the peddler who, in times past, plied the streets with books and pamphlets literally hanging off him, Nancy emphasizes the sensuality of this commerce and reminds us that this form of consumerism is like no other, one that ends in an experience-reading-that is the beginning of a limitless dispersion, metamorphosis, and dissemination of ideas. Making, selling, and buying books has all the elements of the exchange economy that Marx analyzed--from commodification to fetishism--yet each book retains throughout an absolute and unique value, that of its subject. With reading, it gets repeatedly reprinted and rebound. For Nancy, the book thus functions only if it remains at the same time open and shut, like some Moebius strip. Closed, it represents the Idea and takes its place in a canon by means of its monumental form and the title and author's name displayed on its spine. But it also opens itself to us, indeed consents to being shaken to its core, in being read each time anew.